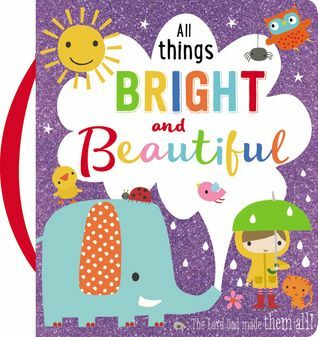 All Things Bright and Beautiful, a charming new padded board book for young children, will be a bright, glittery addition to any home. This padded board book with plastic handle sparkles with its eye-catching cover and colorful, fun illustrations. With glitter on every page, your little one will be engaged with the lyrics from the classic hymn “All Things Bright and Beautiful.” Enjoy celebrating God’s beautiful creation through this adorable book that your children will want to read over and over again! The padded covers, thick pages, and handle are perfect for little hands, and the glittery artwork and simple, classic lyrics will appeal to any young child. All Things Bright and Beautiful will delight your family as you cuddle up and read all about God’s care in creation. Cassandra's Review- The book can be sung or read outloud. Maybe even getting your little one to sing it to you? The little handle is super cute and the colors are very bright as well as noticeable.